and Robert McCarthy pause after Mass. Our call to live Marianist spirituality is first of all a call to live by faith. beautiful music for the celebration. Faith makes real for us things which before were not real. This takes place in one way in our mind and in another way in our heart. 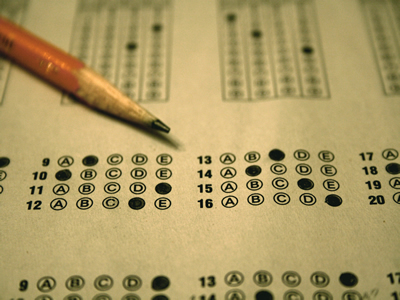 First, faith means we accept with our mind something as true or as fact which we cannot prove. and which our senses cannot directly experience. There is a second dimension t our faith. but likewise embracing it with our feelings. That is what he called "faith of heart." but should also affect our feelings. by believing from the heart you are made righteous. Faith of mind alone does not sanctify." 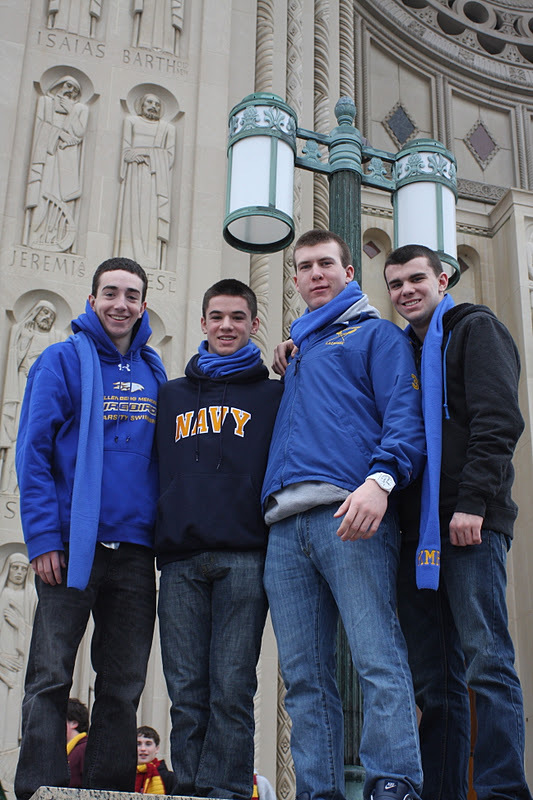 Four bus loads of pilgrims departed from Long Island at 7 am and travelled to the National Shrine of the Basilica of the Immaculate Conception for the conclusion of the Chaminade Year. Marianist Brother Robert prepares the liturgy music at the organ console of the Crypt Chapel. Dr. William Mattison gave the keynote address yesterday. 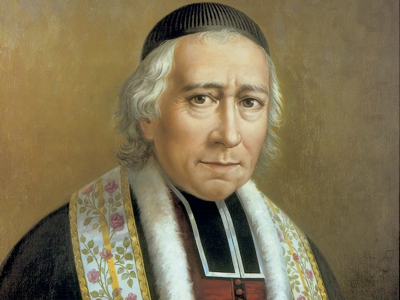 His study of the life of Blessed Chaminade contributed to his address, but his personal experiences of the legacy of Blessed Chaminade was more influential. Many contributed to the festivities of the day. 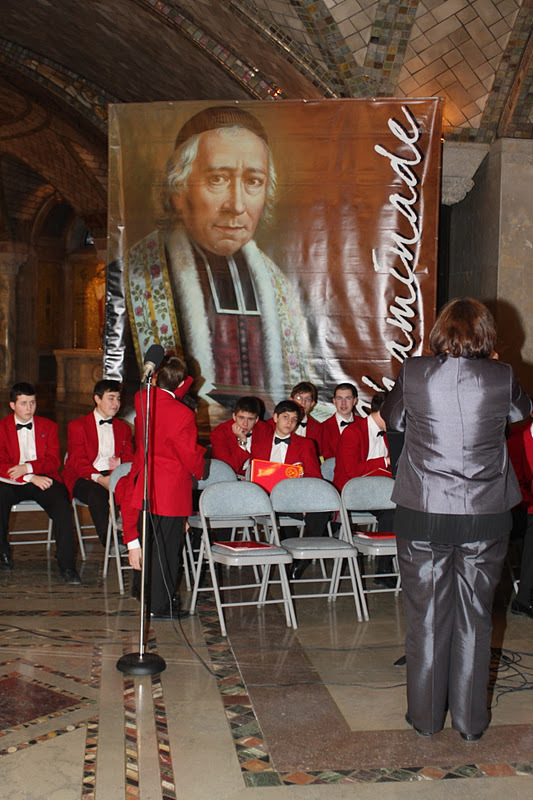 Above, some members of the Gregorian prepare the music for Adoration. Mrs. Peggy Clores participated in the General Intercessions for Mass. The four banner carries pause for a photo. 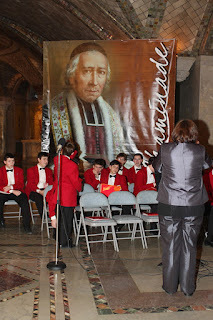 Join us today in prayer as we conclude the Chaminade Year with a National Gathering in Washington, D.C.
William Joseph Chaminade was born on April 8, 1761 in Perigueux, France and died on January 22, 1850. Pope John Paul II declared him Blessed on September 3, 2000. His feast day is celebrated on January 22. Exiled from Bordeaux, France during the French Revolution, Fr. Chaminade fled to Zaragoza, Spain, where he spent many hours in prayer and meditation at the shrine of Our Lady of the Pillar. During these moments of quiet contemplation, he experienced a spiritual awakening and conceived a vision for reviving the faith of the Catholic Church in his homeland. Blessed William Joseph Chaminade believed that Christian communities needed to bring the story of Jesus and the Gospel to life through their daily activities and outreach to others. Mary, the Mother of God, was the model for his renewed faith formation. In Mary, he saw Christian discipleship, simplicity and hospitality. Fr. 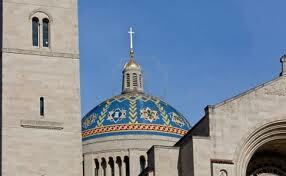 Chaminade thought an “alliance with Mary” would transform the Church. Today the Marianist Family travels to the National Shrine of the Basilica of the Immaculate Conception in Washington, D.C. to conclude this year-long celebration as we pray that the life and mission of Blessed William Joseph Chaminade would inspire a transformation of the Church in our own day. May the Father, and the Son, and the Holy Spirit be glorified in all places through the Immaculate Virin Mary. Amen. On Monday at the Verizon Center as part of the March for Life, Msgr. Charles Pope, from the Archdiocese of Washington, delivering a terrific homily before a crowd of 18,000 young people. Our two Marianist high schools will be traveling to Washington, D.C. to participate in the annual March for Life this Monday. The March is a yearly reminder that life is good and given to us by almighty God. But life always seems to have plenty of difficulty and suffering to spread around. What we need is a group of people around us to shoulder the burdens of life. We need people who will draw us toward interdependence and away from individualism, isolationism and consumerism. We need biblical community. The call is in you -- and it's there for a reason. As some might know, we just finished National Vocation Awareness Week. And hopefully it isn't news to anyone, but this is of universal importance to all of us as every single one of you has a vocation. Now, don't panic: this doesn't mean you're to drop everything and make for the nearest monastery, convent or seminary. If that's what you're feeling called to do, though, then go for it(! ), thanks for your "yes"(!) and know you've got all our prayers and support! 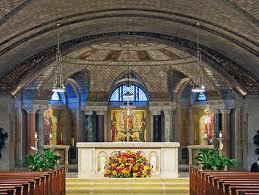 For somewhere around 99% of this Church, however, our vocation lies elsewhere. These tend to be categorized but, in reality, that's only the beginning; indeed, the easy part. Truth be told, there are as many wildly diverse, desperately needed vocations out there as there are the number of us -- and whatever form it might take, what you (yes, YOU!) are called to do, the gift you've got to share, is something no one else can bring to life as well or as fully as you can. And, thing is, much as some might not realize it, think it too crazy or needless or (worst of all) try and fight these movements of the Spirit, try as you might, the call is in you -- and it's there for a reason. Whatever it might be, the signs are universal: it's what makes you burn, brings you joy, makes life good, gets you up in the morning (sometimes keeps you awake in the night, too) and -- even with the knowledge that it'll never be fully perfect nor without its sufferings, burdens and trials -- you really can't see yourself doing any other thing with your days and giving it everything you've got. In a nutshell, your call is that one thing above the rest which makes you happy and gives life to you and others. You'll know it simply by finding it and knowing you can't be anywhere else -- and in some cases, even now, even if you don't think you know or have found it, somewhere down deep inside, it's already there and maybe just needs a little extra figuring out. Many of us have been blessed to find this "project of God" in our lives, summon up the courage to try and -- warts, limitations, sins and all -- start down the path. Something seems to say, though, that just as many of us either haven't found it or, for one reason or another, are holding back from it. As with every other good thing, only in the silence can we truly hear and know its answer, and only then can we begin to move closer to the place we each belong. Even for those of us well-set along our paths, our seeking and listening days are never really behind us. So in that light, once the latest round of chaos is all sorted out -- and because, once it's found, every vocation needs its nourishment and renewal -- these pages are going quiet for a few, that the daily feed of what's doing elsewhere doesn't distract this scribe from hearing the most important Whispers of all. In a wild time, so it seems, that's all the more necessary. 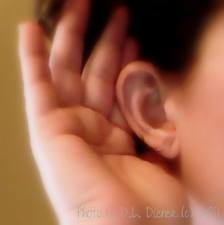 God loves you a lot forever... and in a special way, wherever we might find ourselves along the road, Happy Listening. While the recent NFL divisional playoff game between the Denver Broncos and the New England Patriots was widely watched, you might have noticed a Focus on the Family ad highlighting the Bible verse John 3:16. It is also Christian quarterback Tim Tebow’s favorite. While Tebow and the Broncos didn’t advance to the AFC Championship game, the evangelical Focus on the Family hoped its ad would help extend the online curiosity about John 3:16. On the Monday following the Broncos’ unexpected win over the Pittsburgh Steelers a week ago, John 3:16 was the most-searched term online. In that game, Tebow passed for 316 yards and averaged 31.6 yards per completion. The ad featured children reciting and elaborating on the verse, which reads, “For God so loved the world that he gave his one and only Son, that whoever believes in him shall not perish but have eternal life. Marianist Brother Timothy Driscoll assisted in leading the group through some wonderful reflections on Mary in Scripture, art, and in the context of discerning one’s vocation. On Saturday afternoon all sojourned to a nearby arboretum where all enjoyed the amazingly warm, sunny winter day. The retreat ended on Sunday with a celebration of Epiphany. Jesus surely sees something special in this candid chap from Cana: “Here is truly an Israelite in whom there is no deceit." 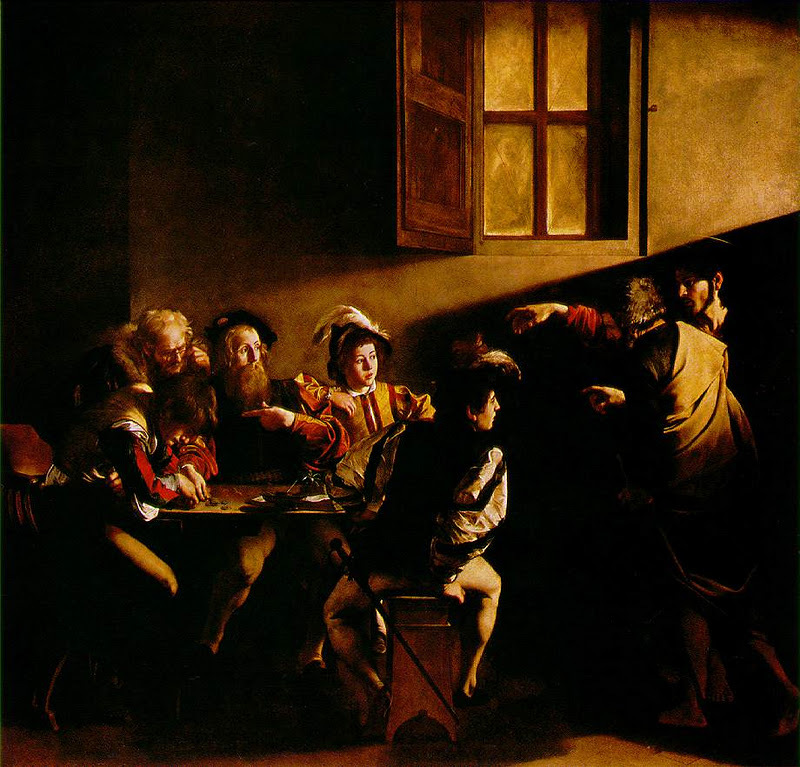 Jesus gives him credit for stepping forward in faith, even though Nathanael has doubt and skepticism. Jesus pays him this compliment because Nathanael is at least open; he’s at the very least going to check it out — see what Jesus is all about. Jesus loves it, and loves him. This willingness to step forward in faith is a commendable quality, one that is every bit as impressive as a top SAT score. But Nathanael was probably not a brainiac — but who knows? He did have faith. He may or may not be in top intellectually, but clearly he’s in the top of the faith life. And Jesus answers, “Do you believe because I told you that I saw you under the fig tree? You will see greater things than these." Jesus invites Nathanael to continue to follow him in faith, and he promises that he will see even more amazing things, including the opening of heaven, and the ascending and descending of the angels of God. It is clear to Jesus that Nathanael is only at the beginning of his faith journey. But if he continues to step forward, he will see things that will make him even more faithful. The Catholic Church in the United States will celebrate National Vocation Awareness Week, January 9-14. God calls us all to live our faith and seek out our vocation to become a deacon, priest, religious, married or single person. Perhaps God is calling you to the priesthood or consecrated life. Will you have the courage to follow your heart? We are all called to love and serve Him and one another. As we continue to walk in the light of Christ and to serve our Lord with our whole heart, mind and soul, may we be filled with the love of our Lord and Savior Jesus Christ and seek to forgive all who have hurt us. - Take time to pray for vocations to the priesthood and consecrated life. 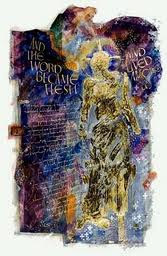 - Reflect on our own vocation and strengthen your personal relationship with Christ. 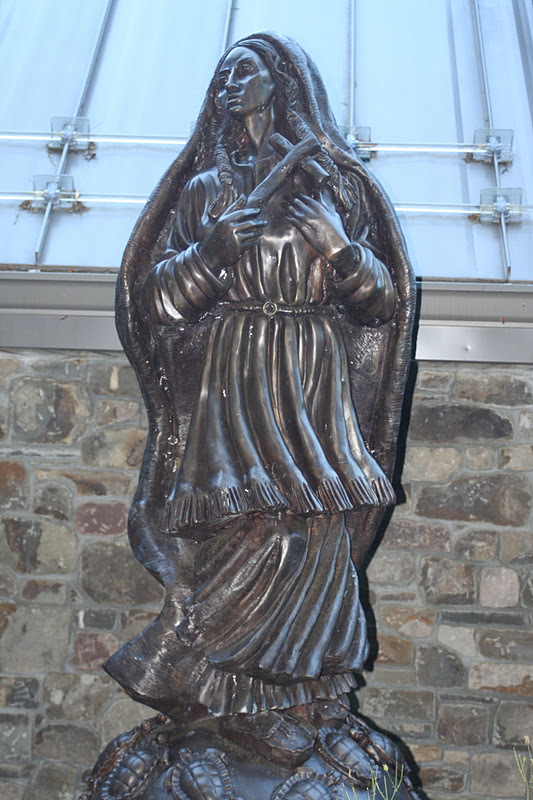 Just before Christmas the news announcing the canonization of Blessed Kateri was heard in the lodge at Founder's Hollow which bears her name. Pope Benedict XVI has decreed that a Sandy Point boy’s recovery from the flesh-eating bacteria that nearly killed him in 2006 is a miracle that can be attributed to Blessed Kateri Tekakwitha’s help, making possible the canonization of the first American Indian saint in the Catholic Church. Monsignor Paul A. Lenz, the vice postulator for the cause of Blessed Kateri, confirmed on Monday, Dec. 19, the link to Jake Finkbonner. Doctors who treated Jake, as well as a committee of doctors at the Vatican, came to the same conclusion, Lenz said. As Jake lay near death, the Rev. Tim Sauer, a longtime family friend, advised his mom and dad, Elsa and Donny Finkbonner, to pray to Blessed Kateri, who is the patroness for American Indians, for her intercession. That is akin to asking Blessed Kateri to pray to God to perform a miracle on Jake’s behalf. The boy is of Lummi descent. The Vatican decided Jake’s recovery was a miracle that is beyond the explanation of medicine and that could be attributed to the intercession on his behalf by Blessed Kateri, who was born in 1656. To his family, who are devout Catholics, there’s no question that a miracle occurred. “In my heart, in all of us, we’ve always found that Jake’s recovery, his healing and his survival truly was a miracle. 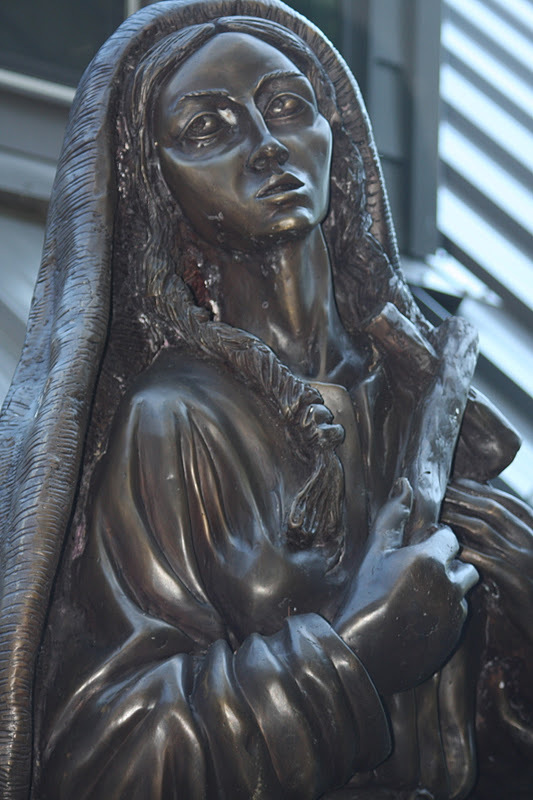 As far as Blessed Kateri becoming a saint, it’s honorable to be a part of that process,” Elsa Finkbonner said. She said Jake, now a sixth-grader at Assumption Catholic School in Bellingham, was excited by the news and also the opportunity to attend a ceremony for the canonization. “He’s excited to meet the Pope. I think that’s going to be the icing on the cake for him,” Elsa Finkbonner said. So, what can you give to your Savior? Do you have time? Then spend time on your Savior. Offer an hour to the Lord as you visit someone in the hospital or an elderly shut-in. Have you been blessed with voice that loves to sing? Present that gift to the Lord and use it in the choir. Have you been given two hands? Fold them in prayer for someone in need. Do you have two good feet? Use them to carry you to the neighbor’s house and invite them to church. Do you have one heart? Offer it to your Savior as a throne. It’s been said, “You can give without loving, but you cannot love without giving.” God has proven that to us. He gave himself to us because he loves us. God’s love is revealed in his Word. And his love is reflected in our lives as we worship him with our lives. Now, that’s an epiphany. Tomorrow is the official beginning of the Epiphany season of the Church year. What does the word "epiphany” mean? An “epiphany” is when something reveals itself, or shows itself. For example, in Barrow, Alaska, after 65 days of darkness, the sun finally reveals its glory for everyone to see. That’s an epiphany. In the Church year, the Epiphany season is when the Son of God reveals his glory for everyone to see. Everything that you see and hear and sing and pray will serve one purpose, and that is this – to reveal to you, to show you, the glory of your Savior Jesus Christ. 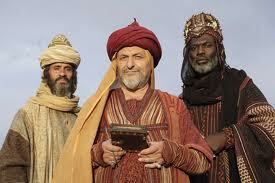 This weekend we recall the visit of the three wise men. While they are often referred to as kings, it is probably more likely that they were astrologers familiar in some way with the coming of the Messiah. Whatever their background; they were wise men from the East who were provoked to action by a star which signaled Christ’s birth. They came to worship at the feet of the new born King, each bearing a uniquely valuable gift. So, what gifts do you bring to the King? 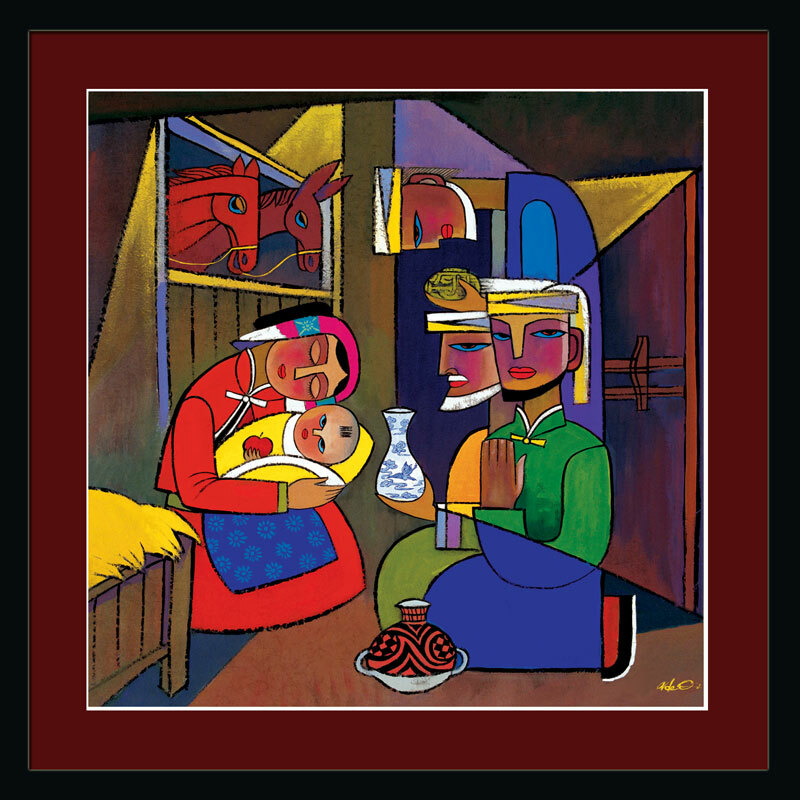 The Magi came before Jesus bearing gifts of incredible value. God has placed gifts of incredible value inside of each one of us. 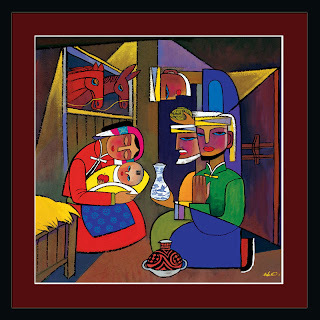 Just as the Magi brought gifts of gold, frankincense, and myrrh, each of us bears unique and valuable gifts for the Kingdom of God. Our calling from God is to share whatever gifts we have in common for the benefit of the mission of the community of faith. I’m terribly afraid that many believers today do not recognize or have not been told what that mission is. The mission of the church is twofold; to edify the saints and to share the love of Christ with this world which is in desperate need of hope. As we approach the Solemnity of the Epiphany this Sunday consider preparing for Sunday Mass by taking some time in the week before by reading, studying and praying over the scriptures we'll hear proclaimed. 'Where is the newborn king of the Jews? The Magi came to do Him homage. They came to worship Him. Now, we kinda know that worship always involves SACRIFICE. Was there a price to be paid for the wise men’s worship? You bet. They had given themselves to a journey. Travel in those days was not very comfortable, in fact, it could be down right dangerous. The wise men had sacrificed their own personal comfort to find the king and worship Him. To truly worship requires sacrifice. The greatest gift – the greatest sacrifice – you can give to God is yourself. You say but I have given nothing to Him today. I say yes you have! Even today you have given Him something of yourself. 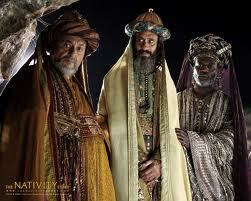 It's time for us to consider the weekend's readings for the Epiphany, "Behold, magi from the east came to Jerusalem." 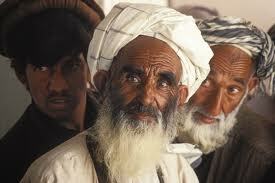 There is a story from a collection of the lives of saints - the saints of Islam - which concerns a king of Balkh (now northern Afghanistan) named Ebrahim ibn Adam. 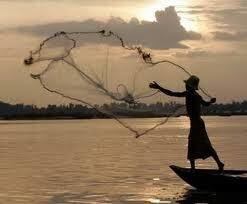 Ebrahim was wealthy according to every earthly measure. At the same time, however, he sincerely and restlessly strove to be wealthy spiritually as well. "One night the king was roused from sleep by a fearful stumping on the roof above his bed. Alarmed, he shouted: 'Who's there?' 'A friend,' came the reply from the roof. 'I've lost my camel.' Perturbed by such stupidity, Ebrahim screamed: 'You fool! Are you looking for a camel on the roof?' 'You fool!' the voice from the roof answered. 'Are you looking for God in silk clothing, and lying on a golden bed?' " The story goes on, according to Jesuit theologian Walter G. Burghardt, to tell how these simple words filled the king with such terror that he arose from his sleep to become a most remarkable saint (Still Proclaiming your Wonders: Homilies for the Eighties [New York: Paulist Press, 1984], 55). The camel on the roof raises the Epiphany question, Where are you looking for God? This compelling question of life properly stands at the beginning of a new year, just as, Where have you found God? nicely serves as a question to cap a year's closing. Each one of our texts raises the camel-on-the-roof question in one form or another. Each text is a camel-on-the-roof reminder that God is not to be found where the world's princes and powers reside. Each text calls us to be like the king's friend, willing to make a fool of ourselves asking the camel-on-the-roof question to a world busy seeking God in all the wrong places, willing to rouse the world with the message of "Arise, shine, for your light has come." I extend a warm welcome to the English-speaking visitors here today. On the first day of the year the Church pays special honour to the Mother of God, recalling how in humble obedience to the Lord’s will she bore in her womb and gave birth to him who is the Light of the World. On this day, too, we pray especially for peace throughout the world, and I invite all of you to join in heartfelt prayer to Christ the Prince of Peace for an end to violence and conflict wherever they are found. Upon all of you, and upon your loved ones at home, I invoke God’s abundant Blessings for the year that lies ahead. Happy New Year!